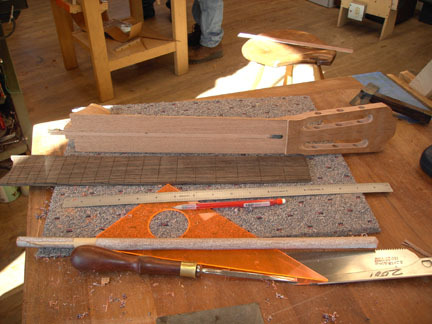 Construction of a Finocchio-designed classical. 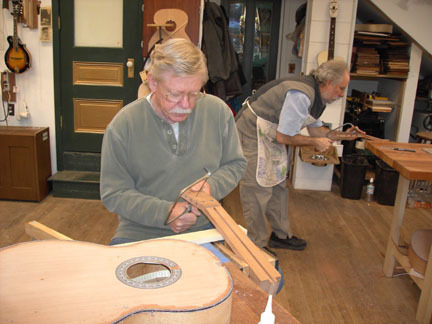 I'll edit the commentary some more, but these are what few pics I have of the class on building a classical guitar. I was playing catch-up the whole time and reluctant to take the time to take pictures. Yeah, I know... silly! Shaping the sides. 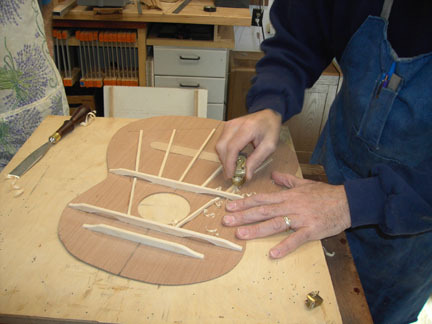 As with the steel string, the sides only get a preliminary bend leaving the major bending to the Fox-style bending machine. Cutting and fitting braces while the sides cook in the bender. 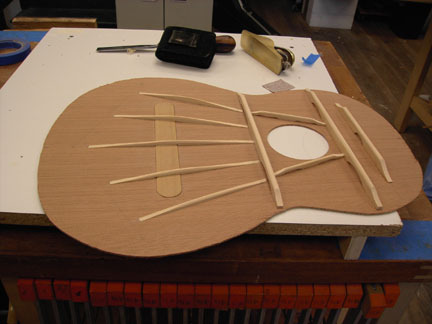 Missed all the jointing of the top & back but it was the same as the steel string. Here's the first side in the mold ready to be marked for trimming. Frank showing Jeff and me how the braces should be shaped. Both sides in the mold, ends trimmed and the tail & neck blocks installed with the glue drying. 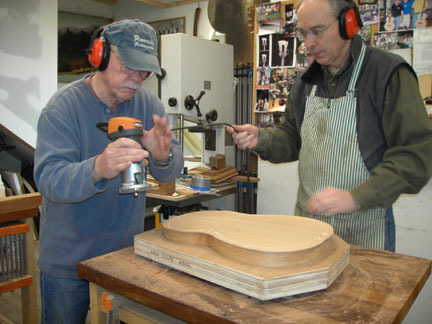 After I got the upper surfaces shaped, Frank showed me how to shape the sides. Not much material left of the original braces... they're really light! Btw, the shape of these braces is distinctly different than what Torres used. 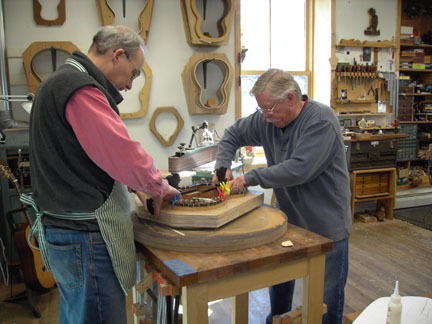 Bill giving me a hand as I shape the rim where the flat section of the top rests (area of the fingerboard). I had previously shaped the rest of the rim to a 32' radius. 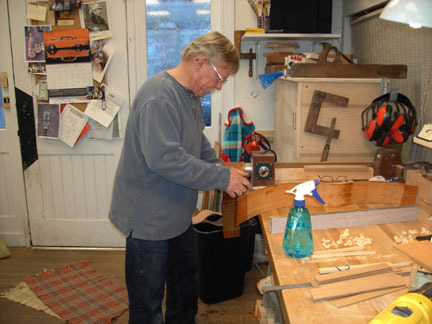 Note the strip of wood right in front of Bill. It's about 0.19" thick which provides about the right angle to accommodate fingerboard with the 1.5 degree neck set. More of the same. Bill held his end still and I did all the moving on this flat disk. 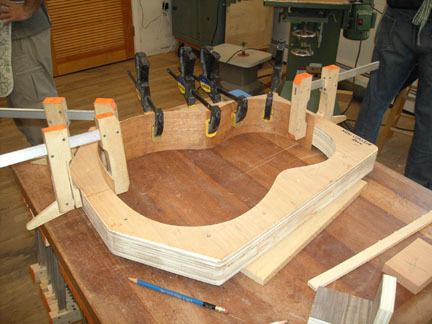 A couple shots of the bracing after the shaping and sanding was done. The fan braces are fit over the bridge patch not thru it. 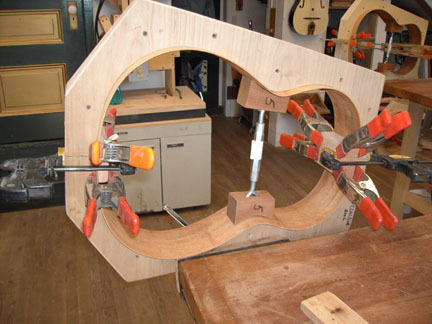 Frank's design calls for cross braces at the bottom of the 5 fan braces ala Torres (he did 5- and 7-brace fans). However, to save time, Frank's prototype left them off. Frank had a visitor at the shop who played the prototype right next to me for about 1/2 hour. 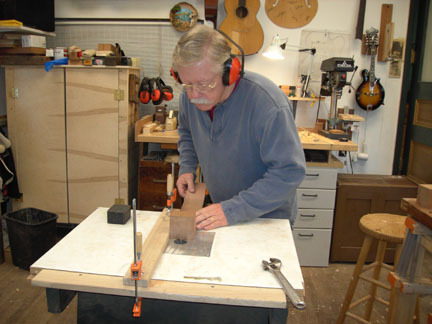 It sounded so sweet there was no way I wanted to build my guitar differently. So I left the end braces off. When everything was done, my guitar turned out to have more punch. So the end braces apparently limit the volume. Glad I did what I did just as Bill & Jeff are glad they did their fans the other way. Starting to route the centerline slot. 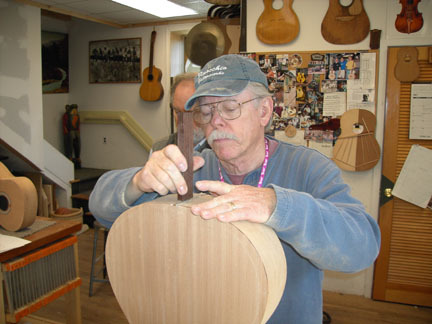 Routing the center slot of the neck. If you look closely you'll see that it's a little off. Should have been right in the middle of the neck blank. Not sure how this happened... there was a lot of time spent setting the guide. 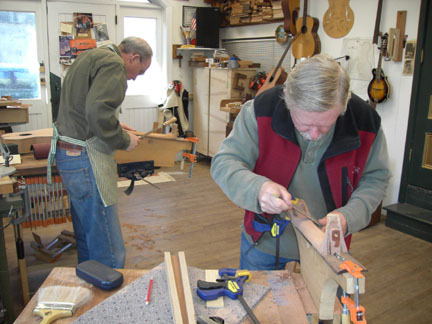 Unlike the typical classical, Frank uses a double-acting truss rod in the neck. 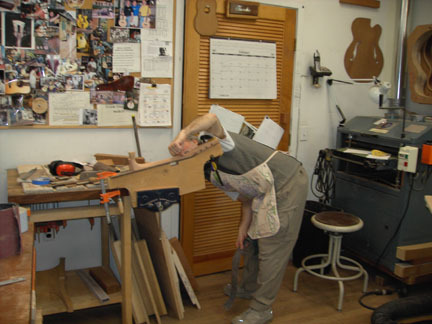 It guarantees that you get precise neck adjustment. Here's the top going on. I was so slow that there were 3 of us putting it together (note how dark the windows are: probably about 7:00 PM!). Trimming the overhang. Not too bad here on the mahogany back, but it was scarey stuff on the redwood top. That stuff cuts like glass and is unpredictable how it will respond to the cutter. Every once in awhile you would hear a shattering sound. Luckily all 3 of us managed to not ruin our tops. A bad chip-out would have meant some repair... no starting over at this point! 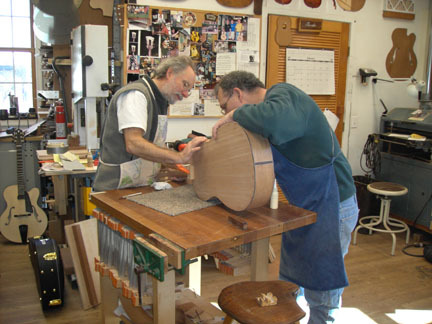 Fitting the tail graft with its purfling. I had a really nice piece of spalted maple from the 1930s. It was a salesman's sample that the Martin company had. Frank had gotten it during one of their many cleanups. 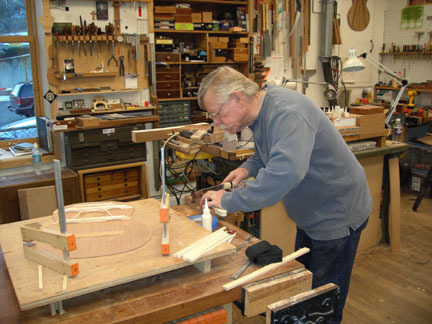 Unlike the steel string class, we had to make our own necks for the classical (but not the fingerboard). The blank was a little short at the heel, so we had to stack an additional 3/4" piece at the heel. 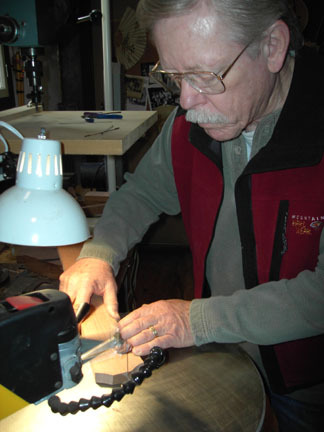 Cutting the headstock shape on the scroll saw. I copied a shape (roughly) that had been developed by Hernandez. 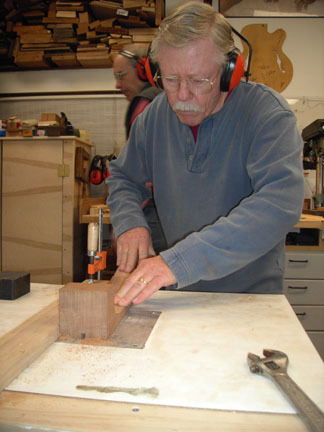 Routing the mortise into the body. Actually, the mortise was already in the neck block... we just had to clear the rim away from the slot. 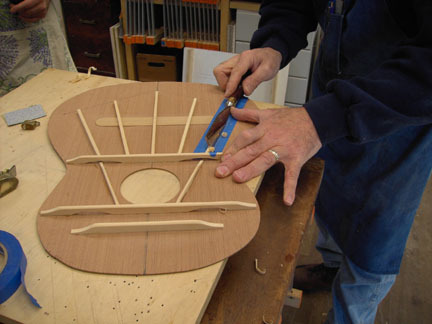 Cutting the slots in the headstock to accommodate the tuners. This didn't go all that well for me as the blade drifted a lot and no amount of rotational force would correct it. Really needed to be routed. Barely visible here is the double lamination: quilted mahogany over ash (white). Came out very nice. The bridge laying in place. 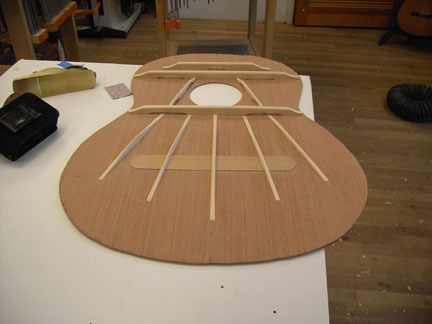 It won't be glued on till after the guitar has the finish applied. We used a highly volatile glue (looked like plumbers glue for plastic pipes but without the purple color) for attaching the purfling & binding. As you can see, it was incredibly messy. However, it set quickly and cleaned up pretty well. I used a scraper to get most of it off, but near the tail I let the edge of the scraper drop too close to the face of the top. Scarred it a bit. Should have been using a curved scraper instead of the straight edge one! 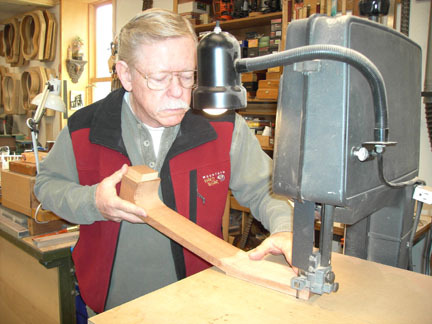 Shaping the neck using the neck jig. 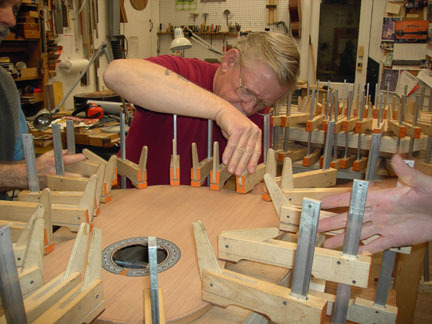 You can see the gluing caul for the finger board laying on the work table. Jeff working on his neck. He worked his a little thinner than I did mine and in hindsight his was the better of the 2. 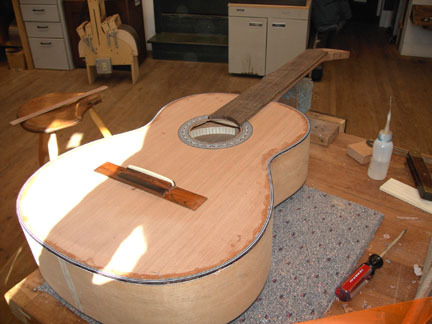 Here's the body pretty much done: the top & back have been cleaned up and some of the sanding is done, the neck is installed and fretted, and you can just make out the 2 holes drilled for the temporary bridge that allowed us to string-up the guitar and play it. Bill has the temporary bridge installed so he can string it up. 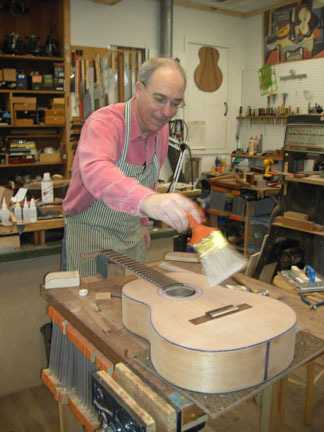 When he finished on Sunday, he took his guitar with him and did a French polish. I saw the pics and it came out great! 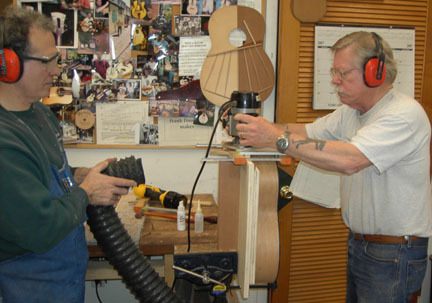 Frank helping Jeff with the neck set. We had to take this pic early because Jeff (right) had to leave to attend his dad's memorial. Bill, however, had been moving right along and was ready to install tuners etc. 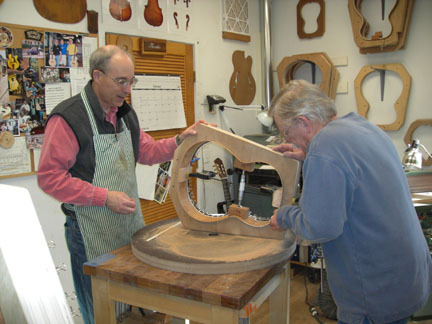 The bridge is a dummy to allow the guitar to be played. It has a couple holes drilled in it to permit temporary attachment. 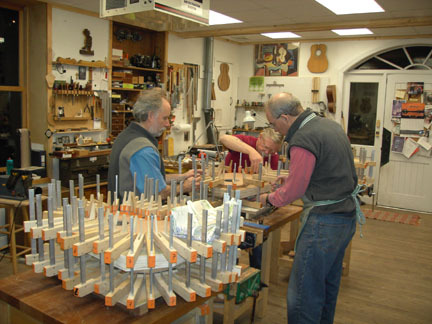 Of course I'm missing several pics which would have described radiusing the fretboard (much flatter than the steel string), making and installing the nut, fretting, leveling the frets, installing the temporary bridge, installing the tuners and stringing up. We had been keeping track of the tap-resonance of the top through all the stages. Jeff's and Bill's guitars were about the same, but mine was different. If you look back at the pics of the bracing, you will see that I departed from traditional Torres fan by leaving out the bottom braces. 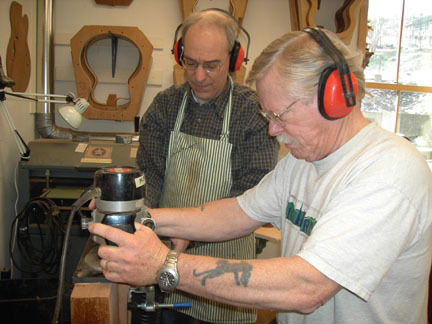 I did this because Frank's shop guitar (his prototype) didn't have them and to my ear had a wonderful sound. 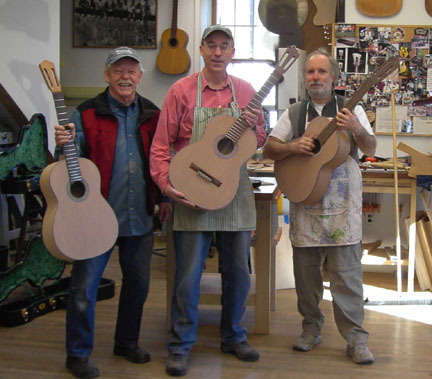 When we checked the tapped resonance of the finished (but unstrung) guitars, mine was a little lower pitched, but not a lot different. 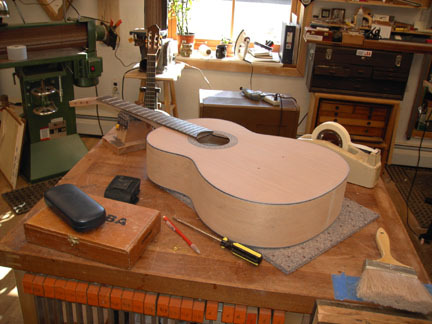 When we strung the guitars up, though, mine faithfully reproduced the tone I'd admired so much in the prototype and had noticeably more punch. I was really glad I'd made the decision!